Lately I’ve been slaving over, Recently I’ve been working on, For the past week, I’ve been revising editing some a few chapters from my current WIP (work in progress) for a contest. If you’re not a writer, you may not know probably have no idea how much of writing is actually editing. 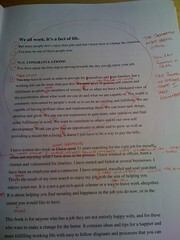 don’t realize how much editing goes into any work of fiction. Or non-fiction, for that matter. It’s a lot. Depending on the writer, I’d guesstimate estimate about 50% 60% up to 70% 50% of my writing a writer’s work time is actually spent actually editing. And I’m not including the time I spend mentally writing and re-writing a particular mentally wording and re-wording a particular description or bit of dialogue. Yes, like many writers, I hear the voices my characters in my head. Unfortunately, they aren’t always as coherent. as they need to be in print. So I edit them too. The problem is, I’m never rarely satisfied, and the next time I read that same passage, it’s highly likely I’ll probably change it again. And again. And again. And again. And again. One would probably think You might think that after writing the same paragraph five ten fifty times, I would become I’d get sick of it thinking about it. Perhaps it’s Maybe because I’m an optimist, but part of me always thinks believes I always think I can do better improve. The weird part is sometimes oOccasionally I revise a paragraph right back to where it started (or very nearly). I’m not sure this happens to other writers, though I suspect it does. If I just wish I I only knew how good is was good enough. If I only knew how good my writing needs to be in order in order to be was good enough for for an agent or editor published, I might be able to leave well enough alone. If I knew the standard of writing necessary for publication, perhaps I could leave well enough alone. Of course if that standard were beyond my ability, I might give up altogether. As things stand, I’ll just keep working – writing and editing, and editing again. This entry was posted in Rant, Rave, Uncategorized, Writing and tagged Copy editing, WIP, Writer, Writing, Writing and Editing. Bookmark the permalink.